Darius Burst Another Chronicle has certainly stirred some attention around the world, it has had a solid release in Japan, and it was shown in Europe a short time ago as well. It should be seen in the US before the end of the year but as Japanese players have been enjoying the game since December, Taito has a new update ready to go in just a couple of days to placate player demand. 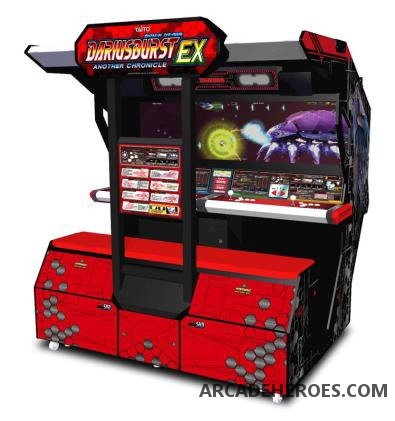 Called Darius Burst Another Chronicle EX, Taito revealed today some details on what the update will include. You can see the slight cabinet redesign above (just aesthetic changes)so I imagine that this will be made available in both dedicated and kit forms so owners of previous DBAC machines can upgrade without much trouble. Whether the update will be made available in English likely depends on how well it sells internationally when that is made available. In regards to the software, they appear to have made some graphical updates which you can see by clicking on the image above. It looks like they have added more particle effects for clouds and dust. But graphical changes are just a minor part of the update. Judging by the top image above, it also looks like they have brought back the Black Hole Bomb from Darius Gaiden. Other enhancements include new ships, a tutorial, new bosses, an enhanced power-up system as well as unspecified “many new elements”. The press release mentions a detailed review of the game balance which could mean several things, I will take a stab at guessing that part of it likely is harder as I heard some fans saying that even the hard path (if you are unfamiliar with Darius, it has branching paths you can select, some are easy, some are hard) was too easy for them. But it also has a tutorial so new players can learn how it all works so at the end of the day it could strike a perfect balance to satisfy the noobs and die-hards alike. We should find out soon enough as Taito has scheduled the Japanese release of EX for this Friday, July 29th. UPDATE: 4Gamer.net reveals that EX will be unleashed in two updates, called Phase 1 and Phase 2. Phase 1 is the update released this Friday and Phase 2 is sometime later. Overall changes are being made to the scoring system, and more added to the Original and Chronicle modes, you can read more about it here. Also in update/sequel news, the latest incarnation of BlazBlue now has a title and they have scheduled a public appearance for the game at the upcoming ChinaJoy 2011 exhibition which starts this coming Sunday. At the moment all we know is the new title is BlazBlue Continuum Shift II Millenium and it will be released this winter in Japan. Taito is currently selling BlazBlue Continuum Shift II (Offline/English) kits but I’m not sure if many locations have picked that up yet or not and how sales have been for that will certainly determine whether they will bother to carry this Millenium upgrade or not. ArcadeUFO in Texas and Southtown Arcade in San Francisco both have the BlazBlue CS2 arcade kits. There is a market in the USA for the newest fighting games; companies like Taito and Capcom are leaving money on the table by not releasing these titles in “offline” versions for US operators. I’m fairly certain both of thse arcades would purchase a game like AquaPazza if an “offline” version were available. I think that’s why Taito released BBCS2 as an offline kit to test the waters. If only a couple of places have picked it up then that will make it unlikely for Taito to keep it up. If they could sell 50 of them at least then I’m sure they would look at fighters like Aquapazza. I agree that there is a market out there for them but it’s only in certain areas. I wanted to get CS2 but my focus has been on AE (which broke down a few weeks ago and is still out on repair). I also asked a lot of the fighter fans about BB and they all had zero interest in it. I have been thinking of the next KOF (which it’s about time for SNKP to announce that) since KOF98 did really well for us as there is a pretty good KOF crowd in my area. Poll Time: Best Game of IAAPA?